Have you seen this pattern, Punch and Cookies by Sew Much Good? Someone at my guild made a couple of these aprons and they were so cute. So I got the pattern and made two aprons (a rare occurrence nowadays, since I barely have time to step into my studio...). Anyway, I just wanted to make a quick project, as Christmas is coming. This pattern is very easy to follow, as is the photo tutorial on the blog. Since I am not a seamstress, I really appreciate detailed instructions. 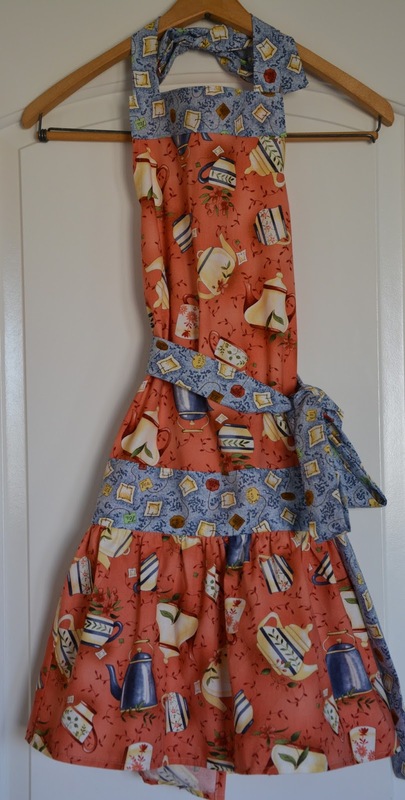 I liked the manner in which we stitched the neck and waist ties... You ought to check out her other cute patterns! (I think her name is Eva but am not sure, as she signs her posts using "Sew Much Good"). 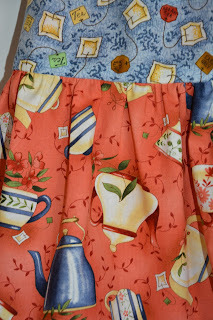 The main fabric for the first apron features tea tags. The contrasting fabric also features tea tags, albeit much smaller and simpler ones. The second apron has cute tea pots, with tea tags on the contrasting fabric. I got these fabrics last year and had no idea what I was going to do with them (I am sure you don't suffer from this same compulsion...). At first I thought of using them for place mats, but when I decided to sew the aprons and started searching my stash, as soon as I laid eyes on them I heard: "Pick us!" These aprons are going to my nieces in Brazil. 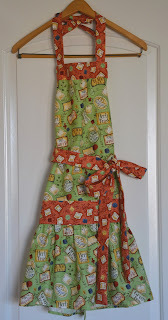 I will ask my sister to take pictures of them wearing the aprons so I can post them here - hangers don't do the aprons justice, and I am sure no amount of money could bribe one of my boys to wear them for better pictures. I hope they like them. It is difficult to make things for teenagers, particularly when you don't see them often and don't know their taste. I have a soft spot for aprons, and these are really cute. Funny how stashed fabric can find itself matched to a project even years later. 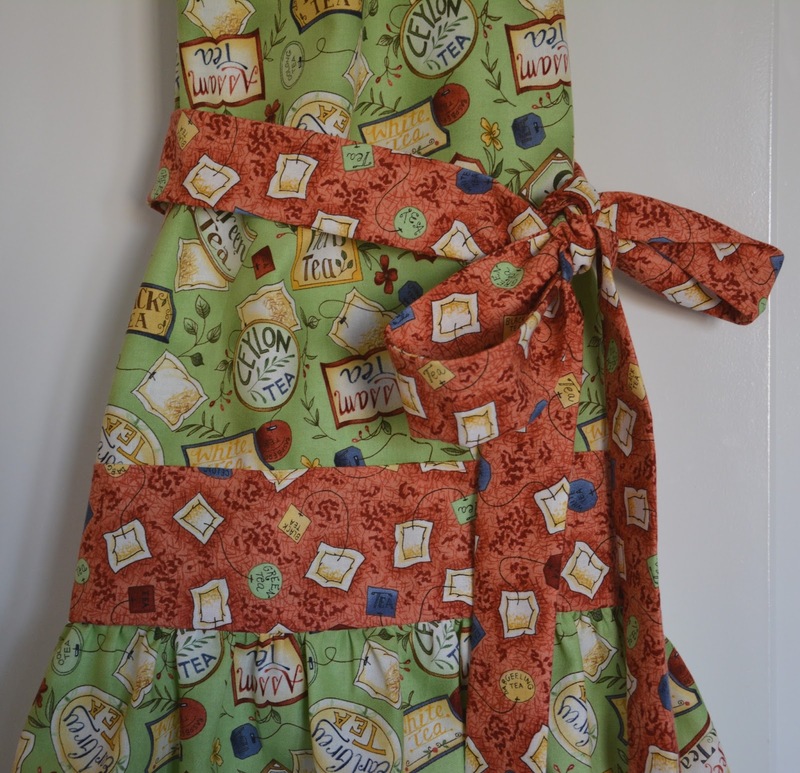 Darling aprons Denise. What a good use for your stash. Your niece's will love them. Very fun you crafty girl! I love Eva Garlicks patterns, she lives in Highland & we sell a lot of them at Broadbent's. I especially love her Strawberry Licorice pattern that looks like it has huge ric rac on the top and waist. Happy sewing (and knitting) my friend!